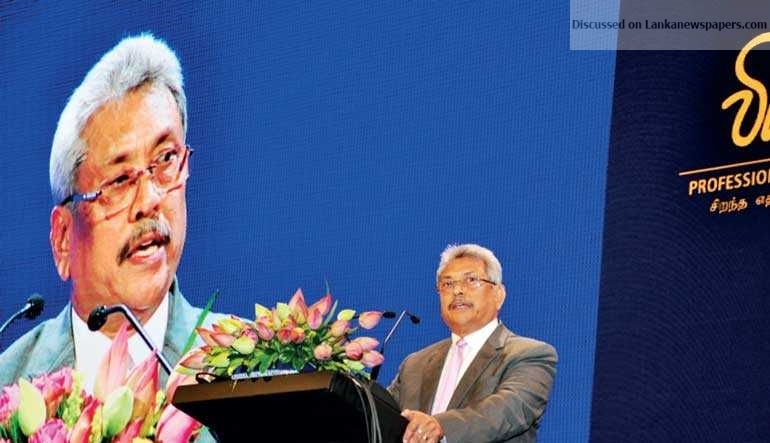 Former Defence Secretary Gotabaya Rajapaksa, who is widely speculated to be a 2019 presidential candidate, yesterday unveiled his vision 2030 for Sri Lanka, promising to transform the economy with futuristic policies and measures but more importantly with the right people and execution. He told a packed and audience of over 2,000 professionals, business leaders, diplomats, clergy and politicians at the Shangri-La Hotel, Colombo that the future window of opportunity for Sri Lanka for faster economic growth hinges on an intellectually and technology competent society via a social open economic policy. Gotabaya was emphatic when he said the foremost priority was economic growth which is the foundation and the cure for all ills of Sri Lanka. He also emphasised that economic growth and law and order went hand in hand. Viyathmaga is a forum of professionals for a better future and Gotabaya is the Chairman. “What do we need as a society?” he asked the forum before answering they were a socialist democracy, rule of law, fairness and justice, safety and security and a conducive and sustainable environment. He emphasised that professionals, intellects, business leaders, entrepreneurs and society at large as well as the Government had a collective responsibility to ensure this. Noting that global economic power will shift to Asia by 2030 with the region being home to four of the top five economic powers – China, India, Japan and Indonesia – Gotabaya asked the forum whether Sri Lanka was ready for this transformation. Noting that past and current economic policies must be reviewed and improved to reverse policies that harm the economy, Gotabaya went on to outline his vision. Amidst a slew of ideas were thoughts on harnessing new technologies to increase value addition in exports and manufacturing, focusing on skilled labour, a knowledge-based and technology-focused economy, modernising agriculture, private sector and SME development, promoting innovation, research and development, greater local and foreign investments, removal of red tape and better management of state resources, etc. He stressed that infrastructure development was critical for the country but returns would be yielded only in the long run. He said that the state should not invest without analysing market realities in order to obtain optimal returns and that state enterprise must make state funds profitable and ensure employees were given fair wages. “Investments should be equitable and profitable,” he added. Focusing on corruption, he said that state sector corruption was a hindrance for economic growth hence systems and processes must be introduced to ensure officials could not indulge in corruption and politicians of stature and high-calibre state officials should be identified to take lead roles. In summing things up, Gotabaya said it was time to embrace nationalism. “Love your country, play your part in its future,” he said, reminding people that everyone counts and Sri Lankans had to move beyond divisions of race and religion. “We are one. Sri Lanka’s future is in our hands,” he added. The Viyathmaga Forum also featured impressive presentations by Vidya Jyothi Dr. Bandula Wijeratne (Ingredients for an innovative economy), Securities and Exchange Commission former Chairman Dr. Nalaka Godahewa (Aspirations for a people-centric economy), 99X Co-founder and CEO Mano Sekaram (Digital and knowledge economy), Social Enterprise Lanka Founder Eranda Ginige (Social innovation, future of business and the rise of the millennials), Prof. Rohan Gunaratna (Sri Lanka’s geopolitics and national security 2030: Continuity or change) and University of Malaya, Malaysia Senior Lecturer Dr. Mohammad Ismath Ramzy (Education for a value-based developed nation through identifying individual strengths and future challenges).